Hits have consistently been about 10,000+ higher than strikeouts for the last 40 years. Then, starting around 2009-2010, they have gradually decreased until this season, where strikeouts league-wide were more than hits. What is the reason for this? Is it a symptom of umpiring somehow? I don't think it's steroids - it seems once a month a pitcher's name is called out for a lengthy suspension. There is probably no single reason for the increase in strikeouts, but a combination of things that have added up over the years. The most important reason though is that pitchers are throwing harder now than they ever have. 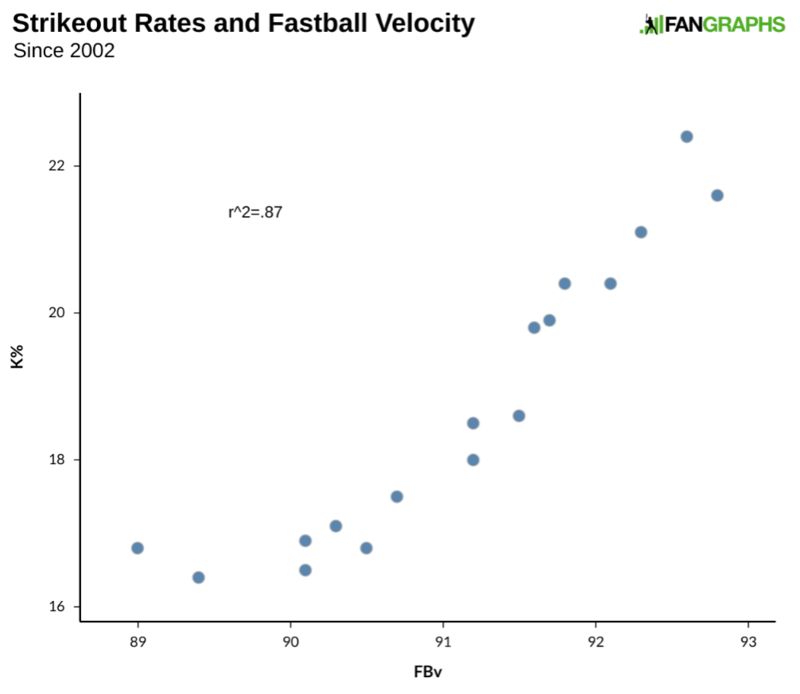 He shows that fastball velocity is highly correlated with strikeout rate. It is also possible, however, that changing their approaches might lead hitters to produce less valuable outcomes or, worse, abandon the very strengths that allowed them to become major leaguers in the first place. That isn’t fair to hitters. What I’d like to posit here is a much simpler explanation for the rise in strikeouts — namely, that pitchers are too good. Fastball velocity has increased at a steady rate, some of that due to the rise of relief innings around the league and some of it probably to dramatic improvements in training and development. That’s not really the point of this post, though. The point of this post is to discuss one particular cause of the increase in strikeouts that likely has little to do with launch angle or players trying to hit home runs, but rather the talent level of the pitchers and a change in philosophy. While it isn't a new idea, there is a huge trend in current hitting philosophy to try to hit home runs on every swing. Launch angles, true outcomes, etc. As a consequence, striking out is much more acceptable than before and players aren't choking up on the bat and just trying to make contact anymore. 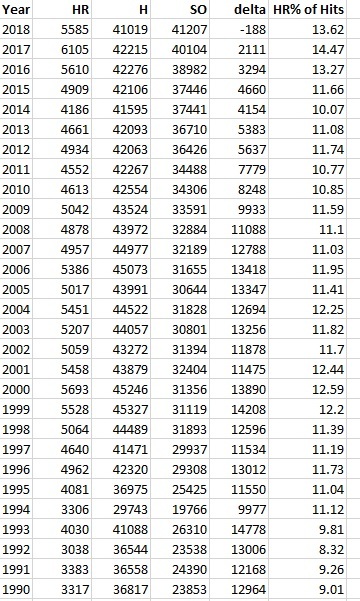 So there's been a steady increase of strikeouts in recent years. I've had a discussion just now with a colleague whom I've been at odds over one subject. For years I fought for the honest ballplayer, and have damned any who use steroids. I think this data shows the effect of rigorous steroid testing. If what we have heard about Barry Bonds is true, that under the influence of PEDs he could see the ball better and make solid contact on a more consistent basis, then maybe the reduction of steroids league-wide is causing this lack of ability of players to make contact over the last 10 years (during which the same time, drug testing has been implemented and is scaring players to play honestly). As a footnote, I will say, I may have changed my mind. If a player wants to perform at some godly level, let him abuse his body as he pleases. I may not have liked Bonds' persona, but it was damned exciting seeing the fireworks. Not the answer you're looking for? Browse other questions tagged baseball statistics mlb or ask your own question. What are the guidelines for declaring for the MLB Draft? Are baseball game-winning hits off the bench becoming more common? What is the MLB record for most errors by one team in one season during the modern era?